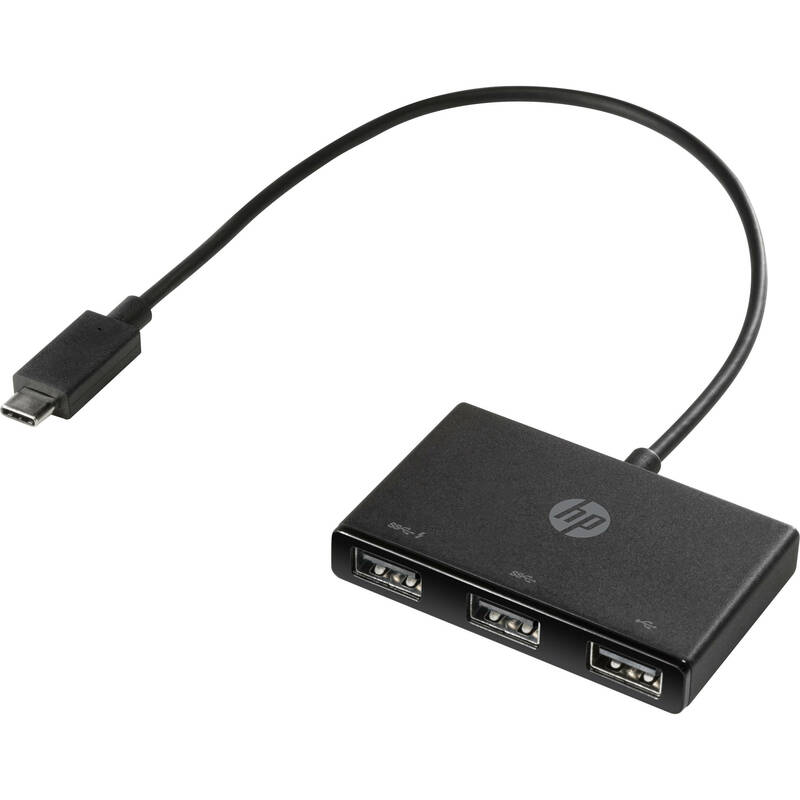 Compatible with most computers that are equipped with USB Type-C, the USB Type-C to USB Type-A Hub from HP allows you to convert your system's USB Type-C port into a multi-port USB Type-A hub, which includes one USB 3.0 charging port, one USB 3.0 port, and one USB 2.0 port. This hub will allow you to optimize your workspace with user-friendly connectivity to frequently used accessories, such as external storage, keyboards, mice, headsets, optical drives, and more. Connectivity to your host system is accomplished using an integrated USB Type-C cable. Simply plug the attached USB Type-C cable into an available USB Type-C port on your device and the hub is ready for your USB accessories. Charge your cell phone with the hub's USB 3.0 charging port and use the other two USB ports to connect to your external storage, keyboard, mouse, headset, optical drive, and more. Wrap the attached USB Type-C cable around the hub for convenient transport or storage alongside your tablet or notebook. Box Dimensions (LxWxH) 8.9 x 4.3 x 1.4"
3-Port USB Type-C to USB Type-A Hub is rated 4.3 out of 5 by 8. Rated 5 out of 5 by Quilted Kitty from Great idea I recently bought a laptop and was dismayed that there weren’t more USB ports. A friend said get a hub....which was a new idea to me. But I got on your site and lo and behold there it was. Totally solved my problem. Just plugged it in to my lap top and now I’ve got enough for charging my phone, syncing my Fitbit etc. and it doesn’t take up much room! Rated 3 out of 5 by Allan from Adequate Light duty construction but works just fine in home study setting. Effectively used to connect numeric keypad and wireless mouse (USB receiver), keeping all laptop connections to one side. Rated 4 out of 5 by PappaD1 from USB Hub for AIO system with limited USB ports Cord to plug into the computer is very short and does not allow for flexibility in placement and often creates hard to use situations, otherwise works well. Rated 5 out of 5 by chuck33 from Very useful. Make sure that you have room next to your computer to place this device. I would not recommend that you place device behind your computer. Rated 5 out of 5 by GhiasR from Great purchase. This product performed what it is intended for without any problems. Rated 5 out of 5 by SSHENHEIT from DOES THE JOB IT IO MADE FOR WELL. THE USB HUB IS A GOOD EXAMPLE OF HP KNOW HOW AND QUALITY. Rated 5 out of 5 by nickname1001 from Works Well The product performs as advertised on the website.